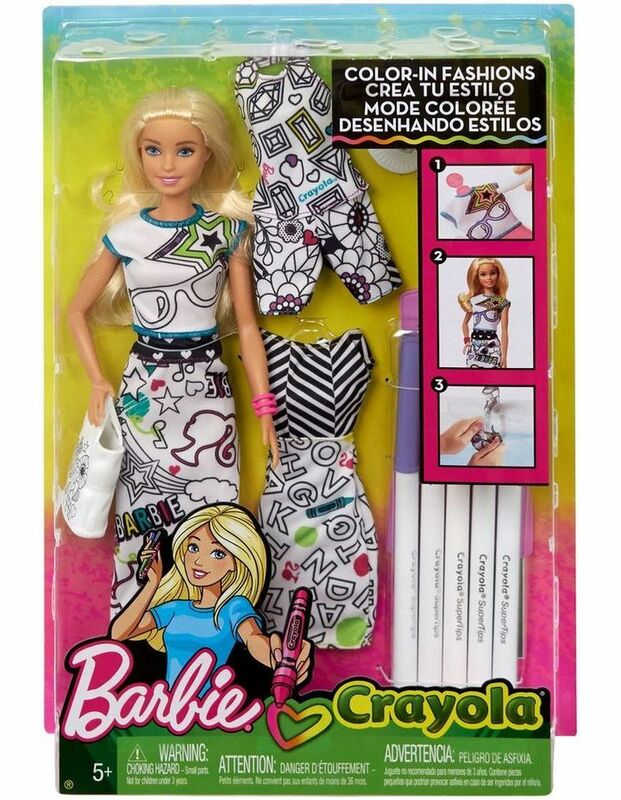 Color in fun and draw out your creativity with Barbie CRAYOLA Color-In Fashion dolls. These Barbie dolls inspire all kinds of ideas with fashions that are meant to be colored in then washed and colored in again for endless fun! Each doll comes with five CRAYOLA markers, two dresses, one top, one pair of shorts, a bag and a hat: all of the fashion pieces are designed in washable white with graphic black designs and a few touches of color to inspire young imaginations. Choose your fashion, place it on the dress form, then color in a little or color in a lot. Play out a story with Barbie doll in the look. Then wash the fashion out and color it again. With a total of five washable fashion pieces and five CRAYOLA markers, young designers can explore so many looks. Theyll love being able to express their style and creativity in endless ways! Includes Barbie doll wearing washable fashions and shoes, two additional washable dresses, one washable hat, one washable bag, one dress form and five CRAYOLA markers. Each sold separately, subject to availability. Doll cannot stand alone. Colors and decorations may vary.